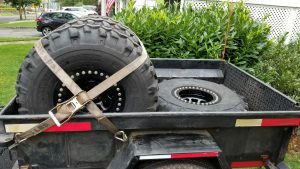 My wheeling rims were getting pretty beat up since my last trip out to Moab and I was having issues keeping the outer bead seated when aired down. Granted, I like to air down lower than most, but this was really starting to bother me. My original idea was just to buy a new set of rims. 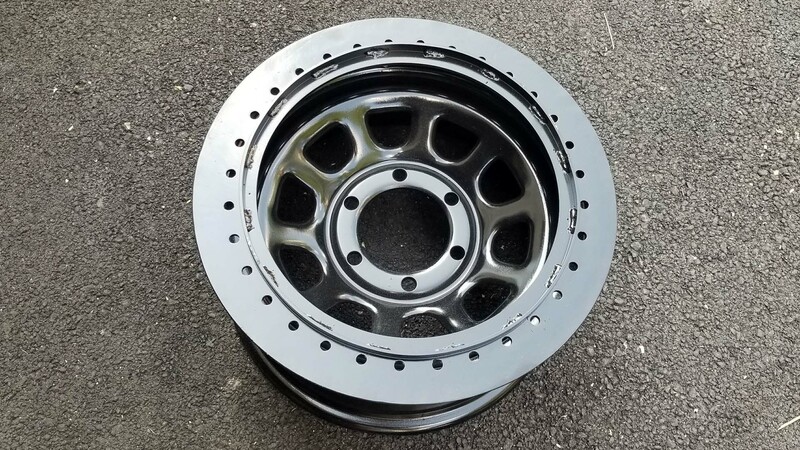 16×8 steelies are pretty inexpensive, so that’s what I did. While I was waiting for them to ship, I started poking around looking for beadlock options and I came across some DIY kits that looked good. 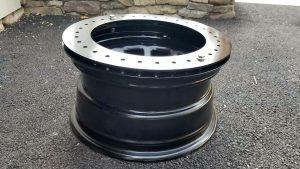 I bought a set from Chassis Unlimited and dropped the rims and beadlocks off at Jay’s shop in Brooklyn to have them welded and painted. The finished product looked pretty sweet. I had a local shop pull the Swampers off the old rims and mounted them up in my driveway. Since you only have to get the inside bead past the rim it really wasn’t a big deal with some soapy water and a small pry bar. Then came the fun part of getting the compression ring on properly and installing and tightening the 32 bolts per wheel to 20 ft/lbs. This has to be done in stages as you don’t want to bend or deform the compression ring. 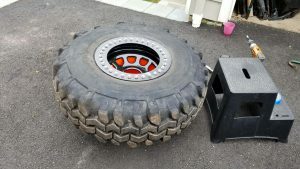 I had the rim sitting on a 5 gallon bucket and that made it easier to turn while tightening the bolts. Did I mention there are 32 per wheel? Yea, this took a while. From cleaning the beads, to mounting the tire, to going around and around and around and around, each time upping the bolt torque, it took roughly an hour per tire. Every part of my body hurts and I hope it was worth it. I’ll have a chance to try them out at Dave’s Place in between meals.